← The summary judgement is in. Can anyone name this tree? It was growing near Pemberton but by no means is it native. I have an idea what it might be. It is a tricky one. And the only clue is a leaf. This entry was posted in Community and tagged Crowdsourcing, tree. Bookmark the permalink. I don’t think it is a sycamore tree because the leaves are all began red and have stayed that colour… definitely the right size and shape though. 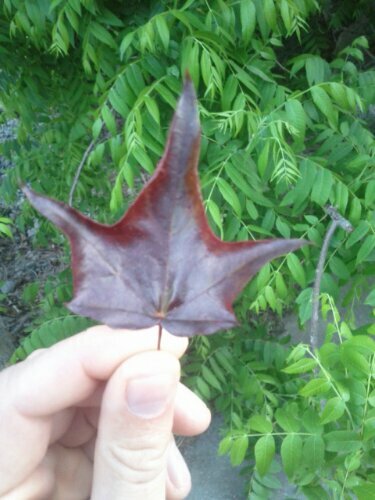 Acer (Maple) genus. Couldn’t tell you the species. It’s ornamental, I’d guess. Sycamores etc can be distinguished from the Maple as their venation does not converge i.e. all Maple veins, like little tributaries, arrive at the stem at the same time. Other Maple-like species tend not to converge that way; a vein will run into another (again, like tributaries) and the larger ones will converge at the stem. I think it is a Norway Maple (Acer platanoides). Both Doug and Joel correctly surmised it was a cultivar of Maple. It seems to be a cultivar that produces reddish-purple leaves rather than green ones. Most likely either “Crimson King” or “Schwedleri“.